Developing a website for your new client? Or are you working on an in-house project for yourself? You sure must have thought about how to Customise WordPress Admin Dashboard. It not only makes the day to day execution of operations simple and easy, but it also ensures that you or your clients have a personal touch to your website’s back-end! However, if you’re still confused if you should go for a customised WordPress admin user interface or not, here at Templatetoaster WordPress website builder, i am sure that the below-mentioned reasons will leave you convinced. Check out! Get out of the boring black and grey admin theme years after years! You can customise WordPress admin interface to add your own colours as per your wish. And you would admit that a well-organised back-end doubles the joy of working! If you are developing a WordPress website for your client who is not much into the technical field, customising the things as per their convenience would surely make it easier for them to use. Why should one keep himself restricted? There is no limit to what you can do! Why not try and explore as to how you can handle the WordPress Admin Interface in a multitude of ways and keep the eyes rolling? Now, that you are finally confident of customising your WordPress admin interface, let’s start with the process. Basically, you can customise your admin interface in two ways – with the help of plugins and with the help of themes. There is a range of themes available today that can help you to customise WordPress admin interface, but choosing one out of so many is always a herculean task. Not anymore! Blue Admin is a free admin theme that although doesn’t offer too much on the platter, but whatever it does is just perfect, to begin with! It provides you with a clear and crisp design, essentially in blue, which is definitely a far better alternative to the boring admin interface that comes by default. Additionally, it also has an array of wonderfully implemented sub-menus and drop-downs. You can also add custom navigation menus on the toolbar with the help of Blue Admin. The Fancy Admin UI is the next in the list to customise WordPress admin. It has a default colour scheme of grey and blue which keeps things nice and clean. You can customise the theme further as per your requirements through the Settings panel. Slash Admin makes the things a bit easier with its intuitive interface. It helps you in doing a little more which would otherwise require third party plugins. slash lets you add Google analytics code for easy tracking, helps you in keeping your database clean by restricting the times the content is saved automatically. It also allows you to enable maintenance mode. TemplateToaster is a theme designing software that allows you to build and customise your own themes not only for WordPress but for Magento, Joomla, Prestashop and others as well. It helps you customise header, footer, sidebar and the likes. All you need to do is to go to theme options and get started to configure various options. AG custom admin is an easy plugin that allows you to customise your WordPress login page, admin menu, admin panel and the likes. You can easily change or hide admin bar items, add a custom menu, apply admin panel themes, brand your admin panel and do much more. Further, the plugin also allows you to change background and admin colours. Clean the clutter from your WordPress back-end through Adminimize. It helps you maintain a clean and clear interface. You can deactivate and activate every part of the menu and sub-menu, administer meta fields, minimise the back-end header and the likes. It supports custom post types and is compatible with plugins for meta-boxes. Admin Columns gives you the power to organise and manage columns in the posts, comments, users and customise WordPress admin panel. Rest assured, you can transfer your WordPress admin screen into a more clear and beautiful one on the go! Admin Column is equally compatible with all major third party plugins and custom columns. Admin Management Xtended is a WordPress plugin that adds AJAX driven options to your management pages. You can easily change publication date and title, post/page visibility without reloading the page through this easy to manage plugin. Bless your clients with a more intuitive and personalised content management system. White Labelling a Website is a way of having a custom logo and other visibly-appealing graphics and information in place of third party content, particularly WordPress’s official. You gear up to white-label in each method possible so that you can website branding. 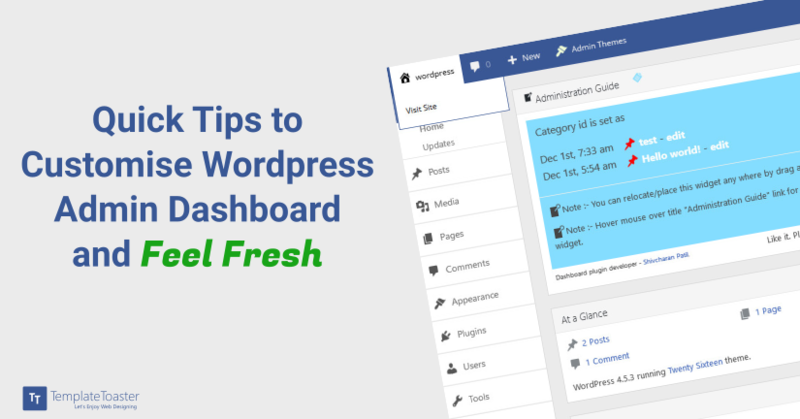 You can also remove all the existing panels from your WordPress dashboard and insert your own panel. Want to add a custom header, footer and logo? White Label is all ears! Well, definitely, the WordPress admin interface is surely going to see various enormous changes in the coming years. It is going bigger than ever. With a range of admin themes and plugins that are available at one’s disposal, it would be only interesting to see how far one can customise WordPress admin. What are your views on this? How essential it is to customise WordPress admin interface is for you? Which method you like to go for? Would you use plugins or themes to meet the purpose? Let us know in comments!